AC4: Black Flag is the sixth sequel in the Assassins Creed franchise that started six years ago and takes place in the Middle East during the Crusades. Since then we have been In Italy during the Renaissance, Turkey and finally in Assassin’s Creed 3 in America during the 18th century in its fight and independence from the British Crown. What differs AC 4 from its predecessors is that it was made for current and next gen consoles as well. As we all know (at least we who played Assassin’s Creed games on PC ), porting and optimization for PC was next to nothing. Games were all capped at 63 fps and only the users with a higher refresh rate monitors, were in position to use the maximum out of their hardware. It’s not that you would ever notice the difference between 60 and 120 fps on a 60Hz monitor, but such poor optimization was more offensive than it had anything to do with the performance. Speaking of performance issues, yes they were all over the place. You would get strange dips in fps although you were running the best PC money could buy and all of that because some one didn’t find fit ( or cost effective ) to optimize the game for multicore CPU systems. Anvil Engine has been improved in many ways since the first iteration of Assassin’s Creed but it has never been programmed to use all of the CPU power that it had at its disposal. One of the most frustrating things when it comes to optimization is AI NPCs and objects that would appear and disappear out of nowhere, which always kind of killed it for PC users to experience the game in the way they rightly deserve. Its not that the game didn’t bring enough to the table on the contrary, but looking back at the past 5 sequels, invisible AI and structures are first that come to mind. 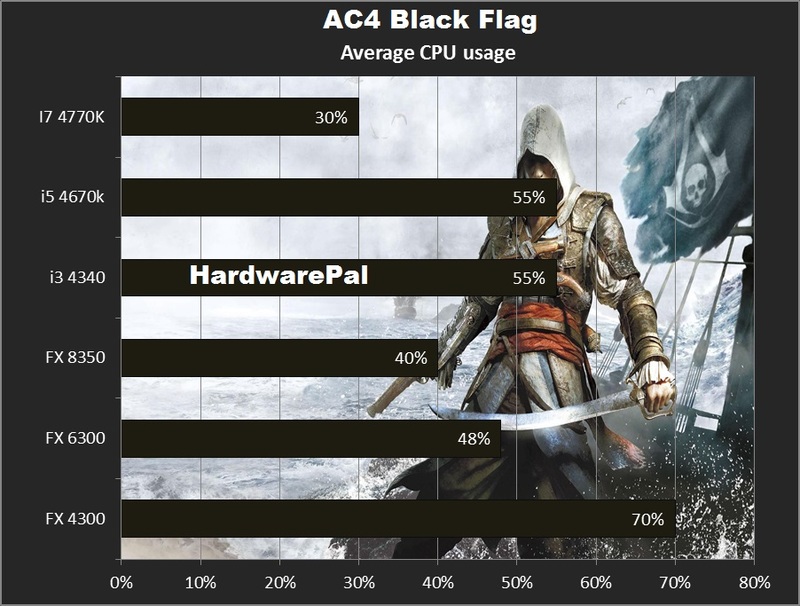 As we said Assassin’s Creed 4: Black Flag was developed for next gen consoles which feature 8 core CPU’s, so we all hoped that the new and improved Anvil Engine would finally see better days in terms of performance. Stick around to see whether our hopes come to life. One more thing, (although regular readers are very much accustomed to this) we are late again with the benchmark since we waited for AMD to release a new driver that would fix the in game performance which was, well bad. Which isn’t something to be amazed about, since this is a game that was sponsored by Nvidia. On the same day when AMD released the new Catalyst 13.11 Beta 9.4 , Ubisoft has also released a patch update for the game it self, and when we ran the game with AMD cards the performance improvements were quite noticeable. 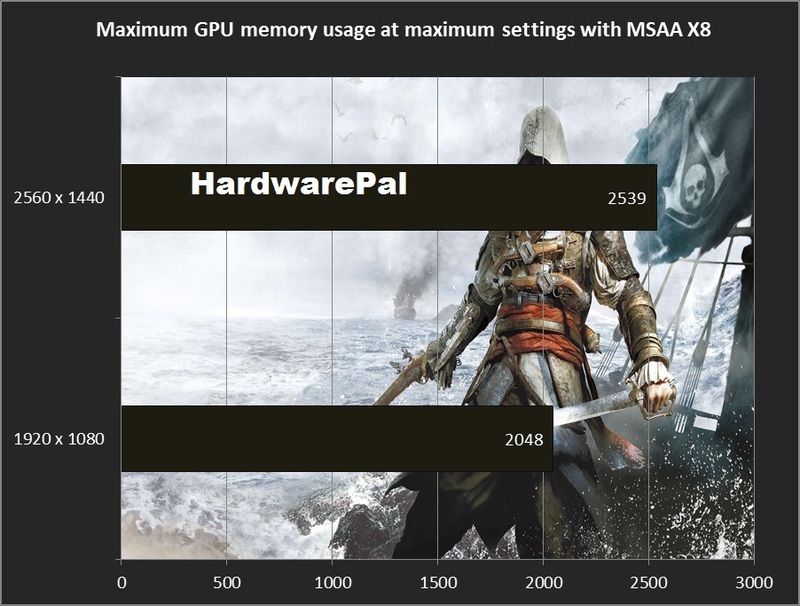 We cannot say for sure which factor enabled the game to run smoothly with AMD cards, since AMD did not mention anything about a performance boost in AC 4 in their release notes. Whatever the case may be ,if you are running an AMD card make sure your game is updated and that you have the newest version of Catalyst. We have also added something new, the ingame image quality comparison slider. Nvidia GeForce GTX 260 or better, GT400, GT500, GT600, GT700 series or AMD Radeon HD4870 or better, HD5000, HD6000, HD7000 series. You can see from the recommended specs, Ubisoft says that a quad core CPU is a must have, which is a step forward compared to previous titles were a dual core CPU was all the power you would really need to play the game. It is nice from Ubisoft’s side that they enabled the game on 32-bit operating systems as well, and put a stop to the trend were all the next gen games (like COD: Ghosts and Battlefield 4) that were ported to PC , require a 64-bit operating system. On the other hand, lots of people have 32-bit operating systems and depriving them of the ability to play this game would not be a good business decision. Choosing exact settings in any Assassin’s Creed game is tricky business. On one hand you don’t have presets which would make users easier to follow the benchmark and on the other hand this Assassin’s Creed sequel carries the 63 fps cap from its predecessors. With that in mind we had to choose representable settings which would enable playable frame rates with all of the cards and to escape the 63 fps cap which would diminish the benchmark since the game wouldn’t use all the GPU’s in their full potential. So after some playing around we found that the settings above provided the best example of how the game should be benchmarked. As we said in the introduction, the game slugged on AMD cards with the previous version of drivers, but with the new driver version as you can see, the 7970 although a far less expensive card, provides almost the the same frame rate as the GTX 770 does. The GTX 770 is a bit faster, 10% in average fps and as well as max fps, however we do believe that you will not notice the difference between these cards while playing the game. People who played Assassin’s Creed 3 with AMD cards know how that game worked horribly and it’s quite refreshing to see no particular issues with Assassin’s Creed 4. As for the 7870 we can see that it’s not performing very well. 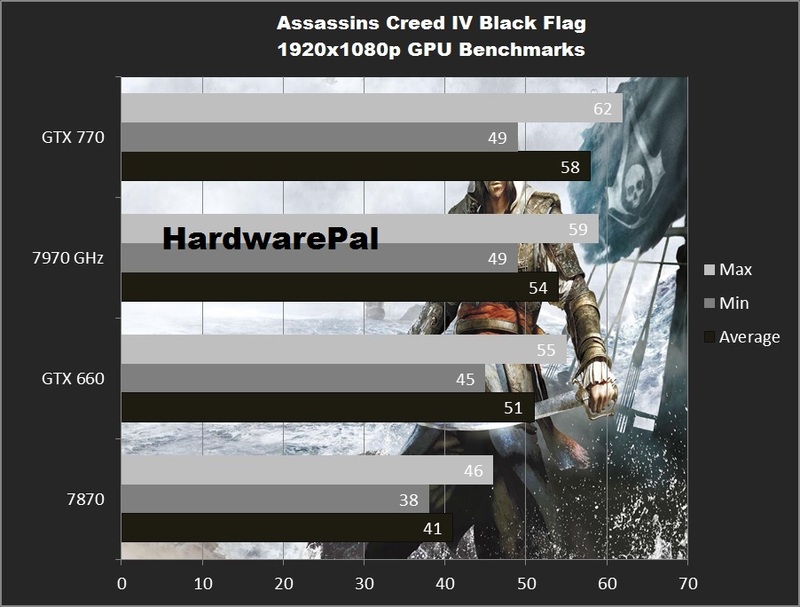 Although the GTX 660 is a slower card overall, in Assassin Creed Black Flag it performs very well for its price, leaving the 7870 behind by around a 15% margin. We have the same performance ratio at 1920 x 1080, the GTX 770 and 7970 perform well but we cannot but notice how the GTX 660 does well not only compared with the 7870 but compared with both the GTX 770 and 7970. Those cards are faster than the GTX 660 at around 30% overall, but in this game the difference is only around 10-15%. As we all know measuring frames per second is not enough nowadays and represents only one part of the experience that a gamer has while playing the game.With frametimes we are able to measure the actual in game smoothness, as well as micro stuttering that occurs from time to time, which can ruin your in game experience although FRAPS or other framerate software says that you the game is playable. Frame time is the lag between frames rendered by the GPU, so the lower the frame time the better. Just to give you a comparison, 10 ms average frametime means that the game will run as smooth as butter. At 2560 x 1440 all four of the cards are struggling to provide a playable experience as you can see. Non of them provide truly enjoyable gameplay, and the 7870 does worse out of all of them again. The 7 series GTX although having the best frametimes, in this benchmark is lacking in providing the norm of 10ms. We are kind of suprised that Nvidia does almost as bad as AMD, considering that Ubisoft made this game in collaboration with Nvidia’s engineers. Nothing great in this scenario as well, although frametimes are much more tolerable than what they were at 2560 x 1440. 16 or 17 ms is not something you would expect from top end cards. Further driver improvements will probably fix this but for the time being we are stuck with what we have. We also noticed occasional screen tearing with Nvidia’s cards at this resolution, playing with driver settings (Adaptive Vsync) in the game itself didn’t help at all. And although the graphs say differently due to this screen tearing AMD cards provided a much better gaming experience although they did not perform better in terms of frame rate and frame times. We do hope that Nvidia will fix this in the near future, we expected better from this company. At settings on which we conducted all of our testing, we can see that 2Gb of VRAM is good for any resolution. Even cards with 1,5 GB of RAM, like the GTX 580 will have no trouble with this game at 1080p. However, what happens if you crank up the settings to their maximum? With all filters up and running a 3GB card is a must have for 1440p, and as for 1080p 2Gb would do just fine. Intel’s i7 and i5 CPU’s perform almost incidentally and the difference is within a margin of error. The i3 CPU does not perform so well but still the price performance ratio is on its side. FX CPUs provide the same frame rate but we are sorry to see that the i3 beats all of the AMD CPUs in this benchmark, we trully hoped that a 8 core/thread CPU will provide much better performance in next gen titles. Wishful thinking ofcourse. For this game 4Gb of RAM is more than enough, we couldn’t measure any bigger values than these provided in the graph. For a big open world game as Assassin’s Creed is marketed, we were truly suprised that the game doesn’t even use the whole 4Gb. We see quite a significant difference between HBAO High and HBAO Low, far better saturation of shadows and colors are provided with the HBAO on High. Check out the Ambient Occlusion Comparison Slider . We also compared SSAO with Ambient Occlusion off. The difference is noticeable there as well, however we were kind of surprised that HBAO Low and Ambient occlusion OFF gave pretty much the same image quality. The first thing that we wanted to see is how CSAA competes with MSAA and the results are surprising. CSAA does provide a slightly better image quality. CSAA (Coverage Sampling Anti Aliasing) is Nvidia’s feature introduced with the GeForce 8 Series GPU many years ago. CSAA filters had the same impact on performance as MSAA filters did (in this scenario) so people who have top end Nvidia GPU’s might consider going for CSAA in this case. Check out the Filter Image Comparison Slider. As for comparing Nvidia’s TXAA and MSAA, although it has been stated by Nvidia that TXAA x4 provides (almost) the same image quality as MSAA x4 with less impact on performance, we cannot say that is the case in this scenario. MSAA did provide better image quality, but it also provided better performance overall. We had around a 5-10% difference in fps with TXAA on the same settings. Although Assassin’s Creed 4: Black Flag is visually the most spectacular Assassin’s Creed till this day, unfortunately this is still the old Anvil Engine working in the background. NPC’s, objects and structures are still popping in and out for no reason. Of course the problem lies within the old engine, which doesn’t use all the horse power on modern day PC’s. The engine is primarily programmed for current gen consoles which hardware is below any standards of PC gamers today. The optimization for PC is not something that developers had in mind while making this game. While the 63 fps cap is still present and who knows what it will take for Ubisoft to remove it. After all here is what Ubisoft’s Assassin’s Creed 4 associate producer Sylvain Trottier said a few days ago: “It’s always a question of compromise about the effect, how it looks, and the performance it takes from the system. On PC, usually you don’t really care about the performance, because the idea is that if it’s not [running] fast enough, you buy a bigger GPU. Once you get on console, you can’t have this approach.” As always the PC gaming community will get the bad end of the stick in terms of optimization that was desperately needed at this point in time. Maybe because AC 4 was made for the previous generation of consoles, Ubisoft decided that making a new or improving the old engine is just not worth their time or money which brought us to where we are now. Hopefully, if the next Assassin’s Creed sequel (Unity) is PS4, Xbox One and PC exclusive maybe we will finally get a game where you don’t run into invisible NPC’s while walking down the street and true buildings that really do exist when you look at them, and not some inter dimensional objects that teleport into the world from time to time. If you have any questions about the benchmark please ask in the comment section below and I will be glad to answer. "I love the smell of fresh hardware in the morning..."